Everybody knows that cooking skills improve when you have the right tools. Different types of kitchen knives have different jobs in the kitchen. For instance, it's not only weird to try to dice an onion with a steak knife, but it is also inefficient and potentially hazardous to your fingers. 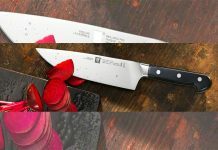 If you have a kitchen knife set, or if you've spent any time in the knife section of a department store, you'll know that the types of kitchen knives range widely. You might think that beyond a chef's knife, the choices are for highly-specialized jobs that only happen in gourmet kitchens. In reality, there are many different applications for these knives. You can save yourself a lot of prep time, make better food, and ensure ultimate kitchen safety with the right tools. You wouldn't try to cut down a tree with a pocketknife, and you wouldn't open up a box from Amazon with your car keys. Well, maybe we all are guilty of that last one, but it's easy to understand the importance of using cutlery for its intended purpose. Many of us don't walk around with a box cutter in our pocket for when that delivery occurs, but we all should stock our kitchen with the right essential tools for cooking. Several cooking tools on the market are highly specialized and have only one or two uses. Unless you are a gourmet who will use their oyster shucking knife or $500 single-edged sushi knife frequently, these would likely spend most of their useful lives sitting in a drawer. Of the different types of kitchen knives, however, most can either make your kitchen job easier or are the only tool for the job. A standard home-use kitchen knife set, such as one that would come in a wooden display block, usually includes most of the basics. 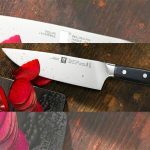 These kits typically have a chef's knife, a pair of kitchen or poultry shears, some smaller utility-style knives and six or eight steak knives. Often, a block comes with a honing steel, to keep a knife edge its sharpest. Among kits, there can be a wide range of options. For between $50 and $75, you can pick up a basic set including several types of kitchen knives that will get you through most recipes. On the other end of the spectrum, you can easily spend $500 for a professional-grade set. Higher-priced options are more durable, stay sharper, and can include more knives for various uses. Rather than blindly paying lots of money for your kitchen knives, consider which ones you'll actually need and base your cutlery budget accordingly. Some types of kitchen knives are an absolute necessity for any kitchen task. A solid chef's knife -- one that is comfortable, not too big, and not too small -- can power through almost any type of prep work. Depending on the type of cuisine you prefer, other knife styles may be useful. If you are interested in learning animal butchery, a cleaver might be an excellent addition to your kitchen tool belt. Part of choosing the right set of knives involves considering your likes and culinary interests. 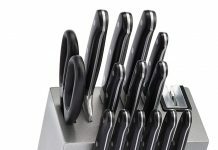 Most people can cover all of their kitchen prep and serving cutlery needs with 10 knives. You will likely use some of these much more than others, but if you are interested in exploring your cooking skills and want to make the right cuts, these 10 knives will get the job done right. The first on our types of kitchen knives list is the desert island knife. If you were stranded and could only have one cooking implement, a chef's knife should be your go-to tool. 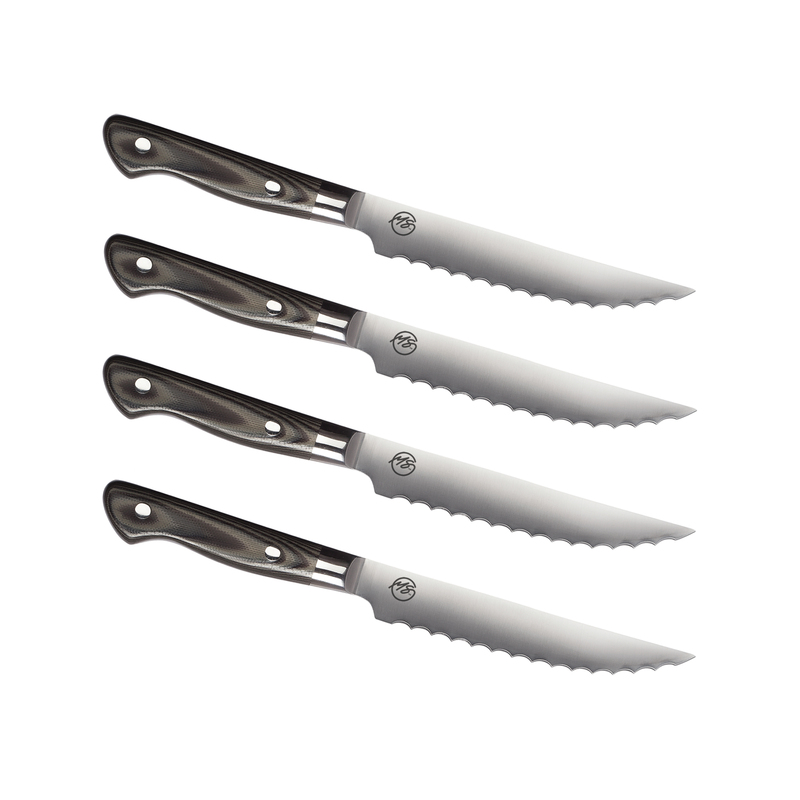 Chef's knives come in various sizes, based on preference for the most part. Some like the balance of an 8-inch chef's knife, while others want something lighter and smaller. Either way, a comfortable chef's knife will handle chopping vegetables and dicing raw meat with ease. This knife is also one of the best tools for pitting an avocado and crushing garlic cloves. Like almost all other types of kitchen knives, a chef's knife can be different kinds of materials. Cheaper knives are stamped out of sheets of metal, while the most expensive models are forged like a medieval sword. Some of these knives retain their edge longer, such as a ceramic knife or Japanese-style chef knife. Different materials have varying weights and feel different in your hand. Since you will unquestionably spend the most kitchen time with your chef's knife, splurge on this purchase for high quality and durability. 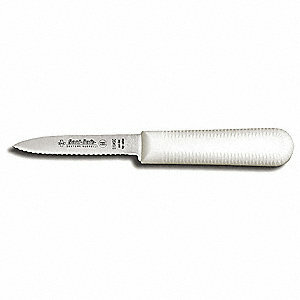 A similar knife to the chef's knife, a utility knife is perfect for handling smaller jobs. Some tasks, such as cutting segments out of citrus fruit, slicing certain cheeses or dicing small potatoes require a mid-sized knife. The utility knife usual has a shorter and narrower blade and is ideal for making quick work of a variety of tasks. A sharp utility knife has earned its place on the right hand of your chef's knife. Some jobs require an even smaller knife. Peeling an apple, mincing garlic, slicing radishes, and slicing open a butcher paper are all jobs made easier with a paring knife. 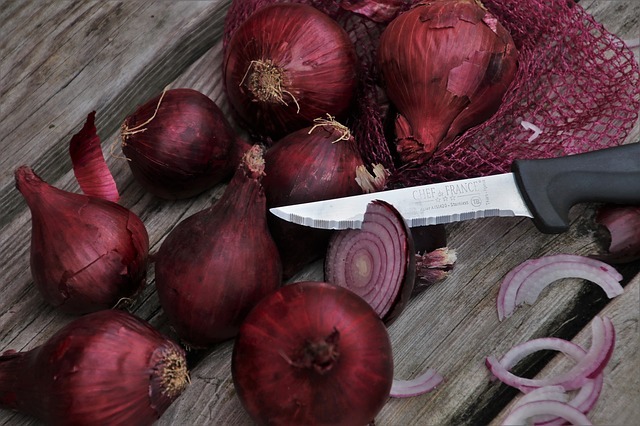 Some master chefs, like Jaques Pepin, prefer using a paring knife for chopping onions — a task usually relegated to the chef's knife. A paring knife also works as a useful small utility knife. If you need to check the doneness of a boiling potato or cut vents into pastry dough, a paring knife makes quick work of the job. A paring knife is also one of the types of kitchen knives that can function as a handy tool for opening packages and boxes. Of course, a cleaver is a top choice for butchering needs. Many know these types of kitchen knives as meat cleavers, and for a good reason. With heft and a sharp blade that is more than double the width of most chef's knives, a meat cleaver can chop up the biggest pieces of meat. A cleaver's heavy blade can slice through bone, too, so tricky tasks like breaking down a chicken or portioning steaks from a larger cut are simplified. Cleavers aren't just for meat though. A heavy cleaver is a perfect choice for cutting large, tough vegetables. Chopping a spaghetti squash, small pumpkin or watermelon can be a challenge for a chef's knife. A cleaver can cut through the tough peels and rinds. There are vegetable-specific cleavers, but most kitchen knife set cleavers can handle plants and animals alike. While a cleaver is a great tool for breaking down an animal carcass, it is useless for removing bones from the resulting cuts. Most types of kitchen knives are unsuitable for fine work. A chef's knife is sharp and handy enough, but its blade width gets in the way of de-boning. Boning knives have the length of a chef's knife, but the blade is much thinner and more flexible. With a boning knife, you can easily locate and slide the blade along the bone to separate without damaging the meat. Another use for a boning knife is filleting fish. 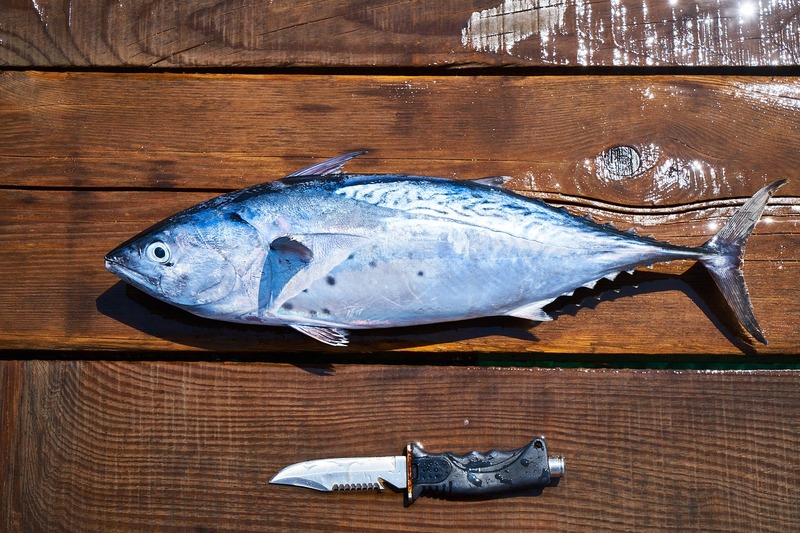 Some chefs prefer to use a chef's knife or larger utility knife for removing the skin from a large piece of fish, such as salmon, but a boning knife does the trick too. Its flexible blade ensures that you only remove the skin, and not any of the flesh. A chef's knife or utility knife may be the star of the kitchen, but they are banished from the bakery. 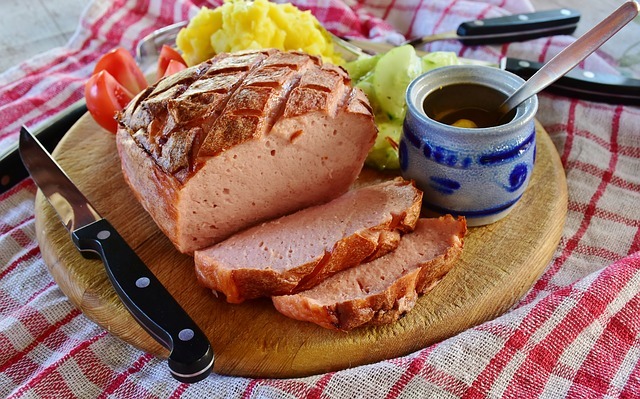 If you've ever tried to slice a nice sturdy loaf of sourdough bread with a chef's knife or one of the other types of kitchen knives, then you are familiar with the potentially disastrous results. Even the sharpest blade simply won't be able to get through a crusty loaf without absolutely destroying the beautiful bread. 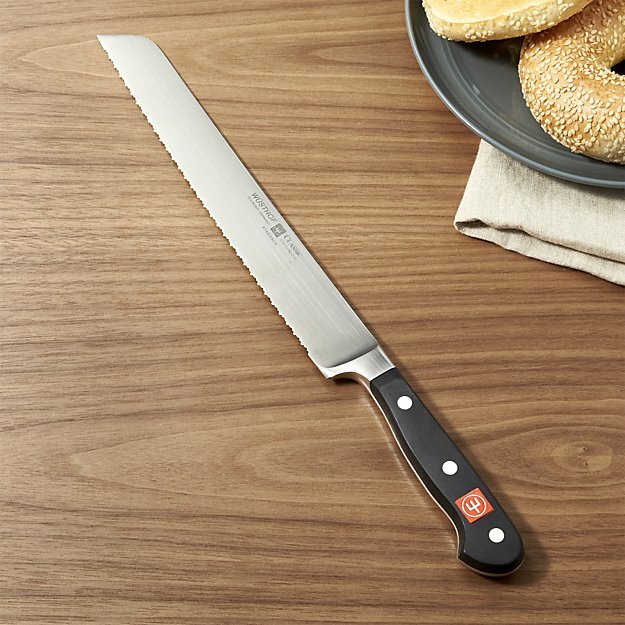 To slice through bread, rolls, bagels and other baked goods, you'll need a bread knife. These are thin, less sharp, and feature serrated blades, which saw through crusts without smashing them down. A bread knife has some other uses, too, such as slicing through a sandwich or slicing tomatoes. 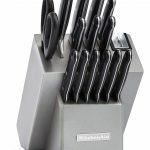 A typical knife block kit will contain a handy set of steak knives. These are sharp, often serrated and are some of few acceptable single-function knives for your kitchen. A steak knife cuts through meat efficiently. It does not do a good job at chopping vegetables or anything else related to food preparation. Since they often have serrated blades, they are also difficult to sharpen. For this reason, you don't want to subject the blades to the rigors of cutting board use. Keep them in the block, and use them in your place settings when you serve meat. Another knife with limited use that is still a kitchen necessity is a carving knife. While you can carve a turkey with a chef's knife or longer utility knife, a carving set helps turn a roast into beautiful slices. 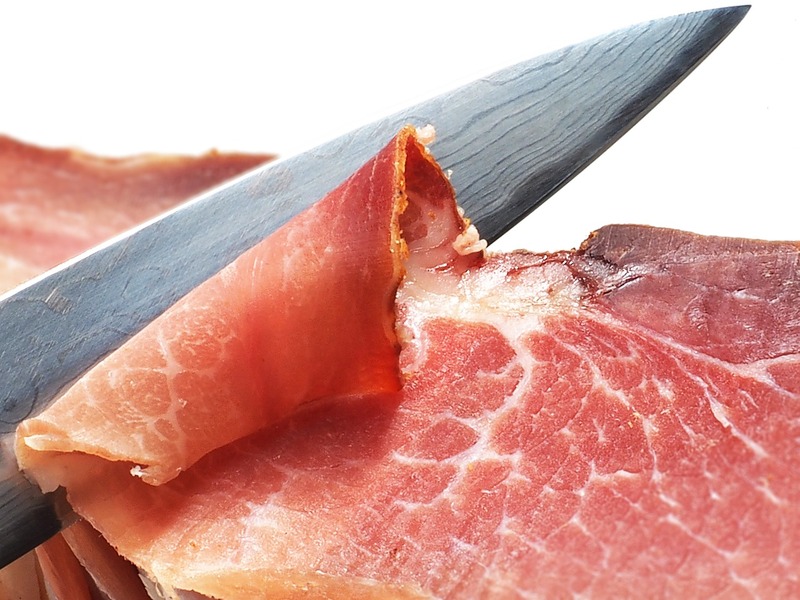 The thin long blade of a carving knife glides through cooked meat, instead of roughly tearing it into shreds. At first glance, a Santoku knife looks just like a chef's knife. The notable difference is in the blade. Instead of a solid stamped or forged blade, these Japanese knives feature a "granton" edge. This creates a scalloped effect on the blade, which helps the knife slice through ingredients with less resistance. Not all Santoku knives have this scalloping, but many in the American market highlight the feature. 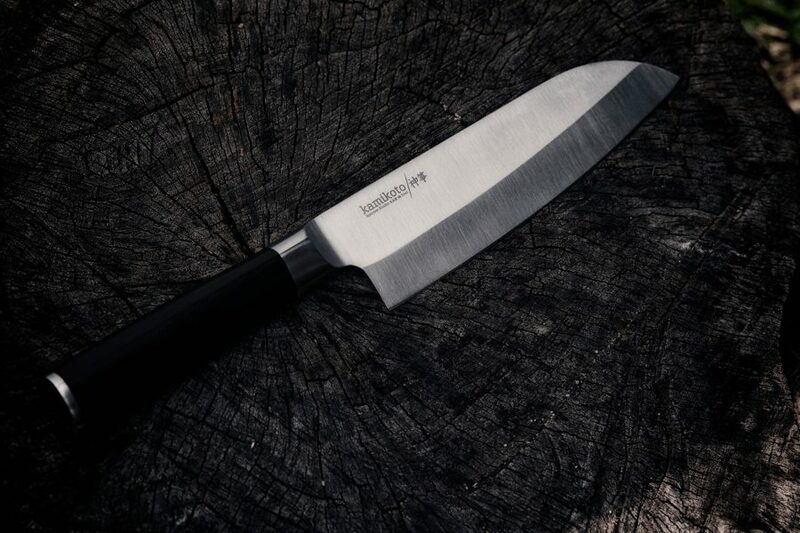 A Santoku knife is perfect for most jobs where a chef's knife would be appropiate but excels in slicing cheese, sushi-grade fish such as tuna, sticky ingredients, and chopping hard items such as chocolate. Kitchen shears are scissors, not a knife, but you'll use these more than anything in your knife block. Use these as utility shears for any time you need to cut something sturdy, such as flower stems, kitchen twine, or that near-impossible to open plastic packaging on some products like home electronics. For food prep, kitchen shears are the go-to tool for breaking down a chicken. If you've never taken a whole chicken and divided it into parts, you've missed out on a key kitchen skill. Next time you are at the market, look at the per-pound pricing on chicken. The more processing, the higher the price. Learn to properly chop a chicken and save a ton on groceries, enjoy fresher food, and make homemade stocks and soups. Kitchen shears are also useful for a ton of other cooking tasks, such as slicing bacon strips and cutting pizza slices. 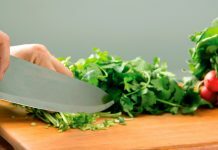 The different types of kitchen knives are tools that make the difference between struggling as a home cook and making delicious food with ease. Like most tools, however, you cannot just purchase a set of kitchen knives and neglect their care. A dull knife is vastly more dangerous than a razor sharp blade. 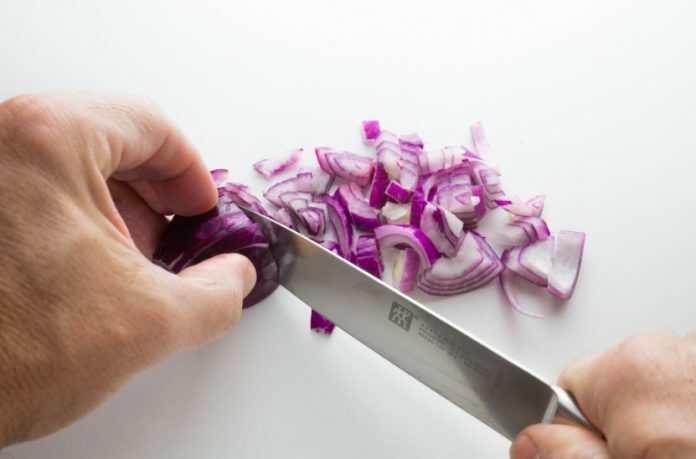 A properly sharpened blade glides through ingredients, but a dull one will slip and potentially knick or slice your fingers. You can keep your kitchen knives sharp through a few methods. The choice depends on the type of knife and its construction. For many knives, an electric sharpener will help keep your blade in optimal condition. 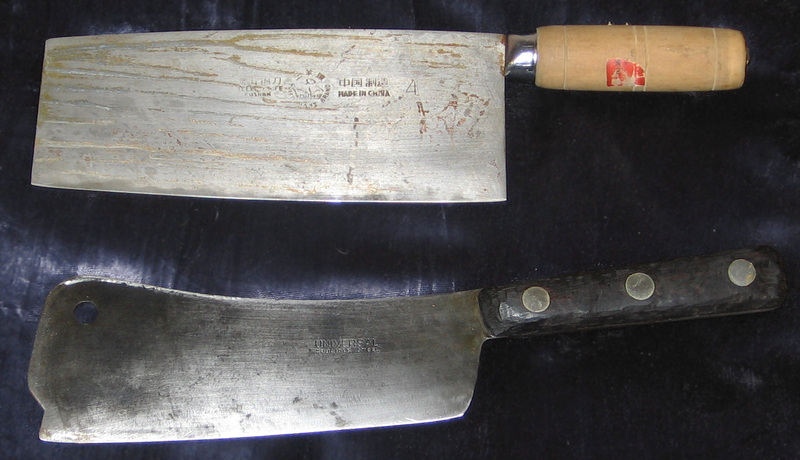 Some types of kitchen knives, such as those made from hardened steel, may require skilled sharpening with a whetstone. This process is complicated and may be best handled by a professional. In such a case, check with your local high-end kitchen supply store, such as Williams and Sonoma or Sur La Table, to see if they have a sharpening referral. Kitchen knives require care in cleaning, too. For most types of kitchen knives, hand washing is best. Stainless steel resists staining, and most food particles do not build-up on a knife's finish. Wash in warm water with mild dish soap, and dry thoroughly before putting back in your knife block. With proper care and using the right tool for the right job, these 10 types of kitchen knives will make you a wizard of your kitchen. What are you going to whip up first?